This is the Object 166M configuration of the T-62 series which took the Model 1975 configuration and added the distinctive BDD applique armor horseshoe around the turret, glacis plate, side skirts, etc. 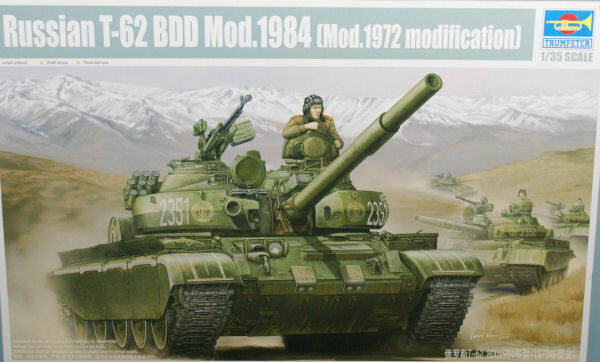 Designated T-62M (Model 1984), the tank also received T-72 tracks, armor plate under the driver compartment to protect against mines, the 9K116 Sheksna (AT-10 Stabber) guided missile that fires through the main gun, new radios, new V-55U diesel engine, and smoke canister launchers on one side of the turret. Molded in light gray styrene, the kit is presented on 21 parts trees plus the lower hull and turret, one tree of clear parts for the periscopes and lenses, four trees of black vinyl (rubber) parts, two frets of photo-etched parts, and one turned aluminum main gun barrel. According to the specifications, there are over 560 parts in this kit.